So, when not quelling Denizen uprisings against my Omnipotent But (Mostly, as Long As You Are Not Interrupting Good Knitting or Precious Reading Time) Benevolent Dictatorship, I’ve been working on the Celtic Lattice vest. I finally finished the ‘vest’ part last night. This morning, because I know that everybody is just dying to see (ahem), I took pictures of the pre-steek-sewed-and-cut vest and set the camera down on the edge of the dining room table. Then I sat down at the other end of the table and sewed and cut the steeks. I was driving off both Boo Bug and Captain Adventure repeatedly as I worked. Both of them were very, very interested by the Big White Machine That Goes Whir. And then I reached for the camera to take pictures of the now decidedly vest-looking article waiting for button, arm and neckbands. It is believed that Captain Adventure made off with it. Where he put it is anybody’s guess. I have gone through the whole house searching and not found it. ARGH. It will undoubtedly turn up someplace obvious. Eventually. I suspect to get it to surface again, we will have to take a Once In A Lifetime trip to Disneyworld. It will surface within hours of getting home. In the meantime, however, I have no way to take pictures of anything other than my Treo, which takes crappy pictures. I really wish I knew a) how he got the camera in the first place, and b) what he did with it. I mean, I will grant you that I was rather involved in the task at hand. I am about as far from comfortable with my sewing machine as a 21st century human can be with so basic a tool. It kept locking up on me. I ended up taking the whole bobbin assembly apart, glaring at it balefully, and putting it back in exactly the way it came out, at which point it worked fine. What.EVER. This right here is why I am in no danger of taking up quilting. Seriously, people, I cannot work a sewing machine. This new one is driving me crazy - I prefer my old Singer. And by ‘old’ I mean ‘vintage 1950-something’. It has two speeds: Go, and Not Go. It can go forward, or back. It has, like, four settings for stitch length and that’s it. No zig-zag. No waves. No buttonhole functionality. Go, Not Go, long, medium-long, medium, or short stitches. That’s it. That’s all I’ve got on the old Singer. I understand this. I can handle this. It is the appropriate level of complexity (i.e., NONE) for my level of sewing skill. Anyway, at some point during this period of sweating, cussing and wishing it weren’t so early in the day because I have a strict policy about drinking before everybody is home for the night, Captain Adventure swiped that camera with all the stealth and cunning of a ninja assassin. And he has apparently transported it into some kind of alternate dimension, because I’m serious: I have looked everywhere. I have looked under beds, in drawers, dug through the toy boxes, checked under all the furniture and in all the boxes (of which there are many!) and behind the piano. Under piles of clothes. In the toilets. In the cupboards. Got down and crawled around the house, questing for the camera. Hmm. I didn’t check the soundbox on the harp yet, but I think I would have heard the reverberating ‘clunk’ – the harp was right next to me. Oh well. It really can’t have gone far. It’ll turn up, probably as soon as I stop looking for it. And then I can show y’all the weird armless phase of existence. 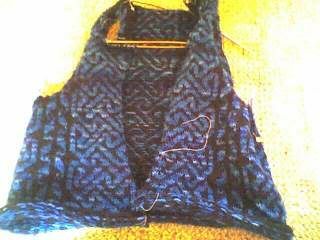 And hopefully, the ‘finished’ vest, which hopefully will not look weird or armless or otherwise odd. Behind the TV, under the couch, inside Steve's Blues Clues house, in a shoe? That's where it might be if it were here. Get a nonworking camera from the thrift store and offer to trade with him. Reminds me of the Steven Wright joke about losing a sock and calling Information. "I said, 'I lost my sock.' She said, 'It's behind the couch.' She was right." Why do boys do this? My daughter doesn't, but when The Boy was two, he would sneak stuff away and "hide" it. The last thing he took was a handmade Thank You card my friend made me. Whenever I get cards like that, I put them on the bookshelf in the kitchen. He took it from there and put it on the little bookshelf in the toy kitchen set in the playroom! I guess his shelves needed a little adornment too. By the way, Mother of Chaos, I added you to my blogroll. Is that alright? As soon as I have space I'm going to try to convince my mother to give me her nice broken sewing machine. great steeking!!! A pity about the camera. That looks marvellous. Isn't steeking fun?? ?